If you have more money than you know what to do with, there is a very nice mountain resort just out of the center of town called Cabanas de los Pinos. The bus can drop you off at the entrance to the resort on your way in to town. The resort has a pool and everything. It will cost you upwards of 800 lempira per night per room. Instead, I recommend staying at Hotel Ipsan-nah in the center of La Esperanza. It is the nicest hotel in town. It is very clean and run by a very friendly and service-oriented staff. It’s a big place with volunteer organizations so reservations might help. Their number is 783-2086. The hotel should cost about 400 lempira per night for a 2-3 person room. A cheaper option in town is Hotel Mejia Batres, which costs 200 lempira per night for a 2 person room, but it does have an early curfew. 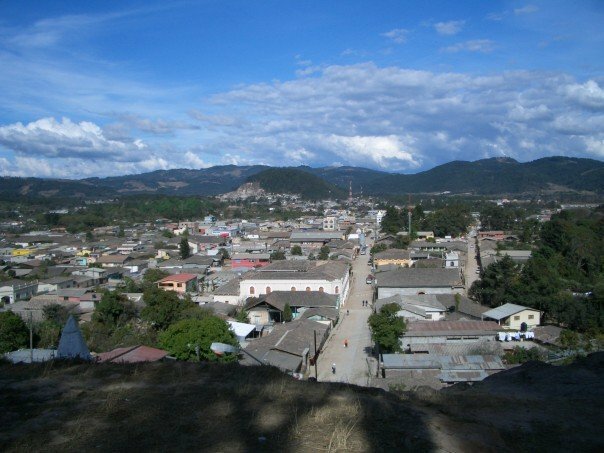 Mejia Batres is located one block off of parque central. Whichever hotel you choose in town, just take the bus from La Guama to the end of the line, to the station on the edge of town. Get a taxi at the station and tell the driver to take you to your hotel. Taxis in town should cost 11 lempira per person. If you want to go to Ipsan-nah, the taxi drivers will probably know the hotel by the name of the restaurant attached to it, El Pollito Indio.